This form allows you to order exams with payment either by PayPal (with an additional $3 processing fee) or by check (with no processing fee). If paying by check, please complete and submit this on-line form and mail the check to CAMWS c/o Monmouth College, 700 E. Broadway, Monmouth, Illinois 61462. Please note that a $2 non-refundable fee underwriting the costs of the examination is required for each contestant. 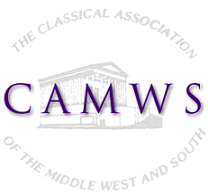 Colleges or universities administering thins one-hour exam must be institutional members of CAMWS. Check here to see if your institution is a current member or to become an institutional member: https://camws.org/institutionalmembership. We plan to administer the exam the week of Nov. 24th.